He doesn’t deny that it has been and will be a polarizing topic in the 2018 draft and after the 2018 draft, but the franchise quarterback debate is a healthy one, due mainly to what happened in the playoffs this past season. That’s why NFL Network draft analyst Mike Mayock decided to poll NFL clubs with what he outlined in his national conference call Friday. Mayock then provided some statistics to point out the value that a franchise quarterback can provide for a team. But then Mayock took a look at the other side of the coin, examining, what for lack of a better term were three journeyman quarterbacks who went deep into the playoffs in 2017. “When you look at Case Keenum, who goes to an NFC championship game, Blake Bortles, even though he was a high pick he was not considered a high level franchise QB, goes to the AFC championship game, and Nick Foles goes to the Super Bowl and wins with the Philadelphia Eagles. Is that an aberration? Or is it a trend? He put his first list of his top five at each position for the 2017 draft class just before the NFL combine. Almost a month later, NFL Network draft analyst Mike Mayock has re-issued his top five by position list from the 2017 talent pool and there has been some movement at some need positions for the Bills. Chief among them cornerback where Ohio State’s Marshon Lattimore moved up to the top spot from being ranked second in the initial Mayock rank. Alabama’s Marlon Humphrey moved up from three to two, while Washington’s Sidney Jones, Florida’s Teez Tabor and LSU’s Tre’Davious White slipped out of the top five completely. Jones’ drop is probably due largely to his Achilles injury suffered at his pro day. Washington’s Kevin King, Ohio State’s Gareon Conley and UCLA’s Fabian Moreau round out the new top five at corner. At receiver East Carolina WR Zay Jones moved up one spot from five to four, swapping places with E. Washington WR Cooper Kupp. And at linebacker, Vanderbilt’s Zach Cunningham and Florida’s Jarrad Davis swapped places, with Davis moving up from four to three and Cunningham sliding back. A lot of times Mayock alters these positional ranks based on what he’s hearing from NFL club executives directly. Here’s a look at all of his position listings. Ole Miss QB prospect Chad Kelly has had a bit of a star-crossed college career full of highs and lows. A big-armed QB with some impressive wins on resume is counter balanced by a pair of ACL knee surgeries and some off the field character concerns. He was dis-invited to the NFL combine a couple of weeks ago due to the league’s recent policy allowing them to restrict players with convictions to violent crimes. Whether Kelly’s guilty plea to disorderly conduct applies has been up for debate. Either way NFL Network draft analyst Mike Mayock says teams better figure out who Kelly is as a person and have a plan in place to keep him on the right path if they draft him. “I’ve said several times that if he didn’t have medical (two ACL surgeries) and if he didn’t have off the field character concerns he’d be in the conversation with the top five quarterbacks,” said Mayock of Kelly. “I think worst case talent-wise he’s a second-round guy. He might even sneak into the first round in some drafts, if we didn’t factor in the medical or the off the field concerns. “Teams have to figure the kid out. I haven’t met him. All I know is there is a bunch of stuff about him off the field. You better figure the kid out and you better have an infrastructure in place with the coordinator and the quarterback coach and the quarterback room that’s going to take care of this kid and make sure he makes the right decisions. There were reports last week that Kelly may choose to travel to Indianapolis to meet with teams on his own accord to sell himself to NFL clubs. NFL Network draft analyst Mike Mayock went for about two hours answering questions on a national conference call. When the subject of Tyrod Taylor came up and his future with the Bills, Mayock expressed the opinion that Taylor could be a capable contributor to a winning team. “First and foremost I’m a Tyrod Taylor fan,” said Mayock. “I understand that the question here is more about cap dollars than it is about whether he’s a capable quarterback. We started out this conversation talking about the dearth of quarterbacks in the NFL. He’s a capable quarterback. Is he a franchise guy? No, I don’t believe so. But he doesn’t turn the football over, but when you complement him with a strong running game and a good defense it’s a winning formula. As we’ve seen in past NFL drafts, there are often runs on a position at a certain point in the draft where all of a sudden there are three players at the same position taken in the span of five picks, leaving a team just outside that range out of luck. Offensive tackle is a position that could have up to five players come off the board in round one. So if a team really wants one there won’t be a whole lot of opportunity to wait. NFL Network draft analyst Mike Mayock speculates that the run on offensive tackles will happen around the middle of round one. Offensive tackle is a potential option for Buffalo at 19 if they don’t like what’s there for a front seven defensive player in terms of value, but based on Mayock’s analysis none of the top four offensive tackles will still be on the board at 19. If that proves to be the case, it’s very likely the Bills explore their options to trade back. With the passing game growing with each passing year in the NFL the demand on defensive players has shifted in terms of priorities and that can negatively impact players at the second level in particular. 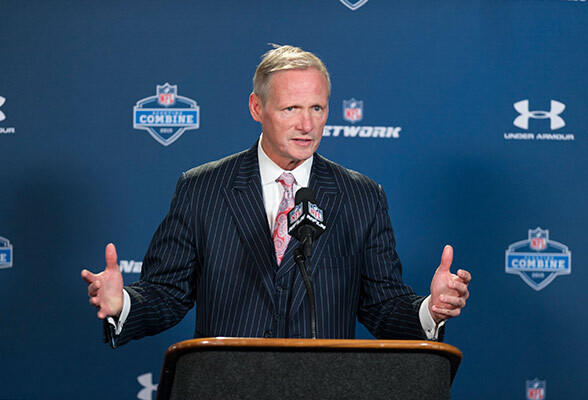 NFL Network draft analyst Mike Mayock believes there will be some linebacker prospects, who lacking the necessary coverage skills, will see their draft stock drop as a result. “The NFL has been evolving the last four or five years more closely paralleling the development of college football,” Mayock said. “There’s been a blurring between the safety position and the outside linebacker. They’re almost becoming often the same kind of guy, fitting the same type of role. One of the most debated ILB prospects is Alabama’s Reggie Ragland. There are some clubs that believe he can play all three downs and handle certain coverage responsibilities, while others see him as a two-down prospect. The Bills are picking 19th overall in round one and there is expected to be quality defensive line and offensive line talent still on the board at that point, positions that figure to be of interest to Buffalo. NFL Network draft analyst Mike Mayock broke down the individual talent he expects to see on the board in the late teens in round one come late April. “On the offensive side, you have to figure (Ole Miss OT Laremy) Tunsil and (Notre Dame OT Ronnie) Stanley are certainly gone,” said Mayock. “If a (Michigan State OT Jack) Conklin or (Ohio State OT Taylor) Decker were there, I think you’d have to look really hard at either of those guys. And one or both could be there. I think they’re really logical. What’s interesting with Buffalo’s pick at 19 is right in front of them at 18 is Indianapolis, which has a more pressing need at offensive tackle with pass rush needs right behind. So a lot of what the Colts do at 18 could force the Bills to adjust their approach in a short amount of time being next on the clock. Buffalobills.com Combine coverage is presented by NAPA Auto Parts. As our Draft Profile series concludes with Oregon State QB Sean Mannion we offer NFL Network draft analyst Mike Mayock’s take on the quarterback who worked in a pro-style offense in college. While the general consensus heading into the 2015 NFL draft is that it is a deep class of offensive tackles, there are no truly elite pass protectors in this year’s draft. NFL Network draft analyst Mike Mayock broke down the OT class and explained why there’s a lot more of the ‘very good’ than the ‘great’ this year. “As far as the offensive line class, let me put it to you this way; after Brandon Scherff, who was a tackle at Iowa and is going to get kicked inside and will probably go in the first 10 or 12 picks, after him, there’s an awful lot of question marks. “Now, that doesn’t mean there’s not a lot of talent, because there is. But I could take, for instance, Ereck Flowers (Miami), D.J. Humphries (Florida), Andrus Peat (Stanford) and T.J. Clemmings (Pitt). And all are gifted first round tackles but I can poke a hole in every one of those kids, either from a technique perspective or an off the field perspective or whatever. “So what’s happened this year is that after Brandon Scherff and some teams like Cam Irving who could be a center, the kid from Florida State but as far as the tackle group is concerned, man, they’ve been pushed down a little bit in the first round, not because of talent, but because they’re not all ready to play day one. That’s somewhat good news for the Bills, who could use a tackle in this year’s draft. With the top end talent this year getting pushed down to the latter half of the first round, and knowing the depth of the class, there should be a decent amount of capable prospects to choose from in rounds two and three should they choose to go in that direction. There will be an awful lot of things that Baylor QB prospect Bryce Petty will need to learn on the fly as he’s drafted to an NFL club this spring. While most everyone knows that he never really operated under center in the Bears’ offense, most may not realize that in Art Briles’ offense he never even called a play in the huddle. NFL Network draft analyst Mike Mayock has said more than once that making this kind of projection on a college quarterback, going from a spread system to a pro-style is among the toughest for NFL scouts. He also doesn’t see Petty as a potential target for the Bills in round two, in light of the fact that they’re still trying to develop EJ Manuel into a bona fide starter. He doesn’t see why they’d be interested in bringing on another development project. NFL Network draft analyst Mike Mayock does not have a quarterback coming off the board in his mock draft until pick 11 with the Tennessee Titans, and it’s not Johnny Manziel. He also has an interesting pick for the Bills. Mayock’s most interesting choices as they could pertain to Buffalo happen at three where he has Jacksonville taking Khalil Mack despite the fact that they loaded up on defense in free agency and desperately need help on offense. He has Cleveland taking an offensive tackle in Jake Matthews at four even though they spent big money to keep Joe Thomas, and then Sammy Watkins fifth to Oakland. At nine he has Buffalo taking an offensive tackle. Eric Ebron is possible, but I would take Martin. You can play him at tackle or guard, even center, and he’ll do it at a high level. He will help make E.J. Manuel a better quarterback. The first quarterback he has coming off the board is Central Florida’s Blake Bortles at 11 to Tennessee. He doesn’t have Manziel coming off the board until pick 16 to Dallas. NFL Network draft analyst Mike Mayock doesn’t believe the offensive tackle class is as deep as some NFL GMs have indicated. That’s why when asked to provide some options for pass protectors in rounds two and three he only had a handful. “It’s not as deep a tackle draft as some might have you believe,” said Mayock. “I think there are going to be a couple of separate runs. The first is in the first round. I think you’re going to see five tackles go. Then I have four guys before the ground kind of falls away and there’s a big drop. So Joel Bitonio, who a lot of people like inside. Morgan Moses, Jack Mewhort from Ohio State, who a lot of people see inside and Ja’Wuan James from Tennessee, who I think is a starting right tackle. Those are the guys on the second day, second and third round guys. While as many as seven wide receivers have been projected to come off the board in round one, NFL Network draft analyst Mike Mayock believes there will still be a ton of talent to choose from at the position on day two of the draft. Here’s his assessment of round two and three receiver talent that should be available. “In round two at wideout Davante Adams from Fresno State, a guy that’s really moving up a lot of board, Cody Latimer, a big guy that ran 4.4 coming off a foot injury from Indiana. A one-year wonder from Clemson Martavis Bryant. You want to talk about a guy with ability, almost 6’4″, ran in the 4.3s, jumps out of the gym, an explosive talent. He’s a one-year production guy, which I think scares people. But his physical skill set is so awe-inspiring, he’s probably going to go into (round) two. I’m not in agreement with Mayock about Latimer. He’s going to be a first round pick somewhere in the 20’s. I’ve got him going ahead of Marqise Lee and others. My mock will be up Wednesday morning. Latimer’s game against Michigan State was impressive. He was boxing out one of the most physical corners in this draft in Darqueze Dennard and making catches like he wasn’t even there, and he’s a very good downfield blocker. Power and speed alone will push Latimer into round one. NFL Network draft analyst Mike Mayock was asked specifically about what he thinks the Tampa Bay Buccaneers will do with the seventh overall pick. Mayock threw out a couple of names, but in his mind they’re taking a playmaker for their passing game. Other draft prognosticators have Tampa Bay taking Mike Evans in the seven hole, which also makes sense. Knowing the success that Josh McCown had in Chicago’s offense last season with two big wideouts outside in Brandon Marshall and Alshon Jeffery, one has to think that Bucs GM Jason Licht is at least thinking about trying to duplicate that in Tampa for McCown with Vincent Jackson and another big target. Of course Ebron could fit that role as well. The Bills personnel department touted Zack Martin’s versatility as one of his best attributes, but they see him as an offensive tackle first and foremost. After 52 starts at tackle for Notre Dame you can understand why. NFL Network draft analyst Mike Mayock agrees with Buffalo’s assessment. What was most interesting was the range in which he thought Martin would come off the board. Obviously 9-13 is a range that includes the Bills first round pick. By now everyone has heard that the 2014 draft offers one of the deepest classes of receiver talent in a long time. NFL Network draft analyst Mike Mayock believes a good number of wideouts could come off the board in round one. There are a good number of reports out there now however, that Benjamin is unlikely to go in round one due to concerns about his one year of production and intangibles. Most NFL talent evaluators have Clemson’s Sammy Watkins as the top receiver on their draft board, but not far behind is Texas A&M’s Mike Evans. We asked NFL Network’s Mike Mayock to compare and contrast their respective games and how they were used may or may not help their transition to the NFL game. “When I look at those wideouts it’s vanilla and chocolate. They make different flavors for different reasons,” said Mayock. “The Watkins kid is explosive. He’s a great route runner, great hands, tremendous run after catch. More than anything he’s a competitor. In addition to all the natural gifts he has there’s an edge about him when he plays and I love that. “Mike Evans is more a product of what today’s NFL environment is. With the advent of the back shoulder throw has opened up the game for the big wideouts, the 6’5” wideouts. Why? Because they can basically play outside the numbers. They don’t have to run as many routes and they don’t have to get in and out of breaks like the smaller wideouts, so they’re running a bunch of outside the number routes that become converted back shoulder throws. It’s just a jump ball. Anytime you get a one-on-one with a defensive back with his back turned and you get a big superior athlete and the odds favor the wide receiver. So Mike Evans I think is what today’s NFL is all about. He’s an outside the numbers and red zone guy. ESPN Monday night football commentator Jon Gruden also feels Watkins and Evans are two receivers whose games do not have much in common. NFL Network draft analyst Mike Mayock has updated his top five draft prospects by position for the 2014 NFL draft. Among the interesting prospects moving up and down include Louisville QB Teddy Bridgewater, who slid from first to third at quarterback. He also moved Virginia Tech CB Kyle Fuller ahead of Oklahoma State’s Justin Gilbert at cornerback. Gilbert is considered by other prognosticators as the top cover corner, but he’s got a slight build and doesn’t offer a ton in run support. Mayock also moved Alabama’s Ha Ha Clinton-Dix up to his top safety. They’re probably all back home by now as the agenda for the offensive line at the NFL Combine is complete, but the top three offensive tackles in this year’s draft all fared well as NFL Network draft analyst Mike Mayock sees it. Lewan and Robinson were first and second in the 40 among offensive linemen while Matthews was ninth. Robinson and Lewan were seventh and ninth on the bench press. Lewan and Matthews tied for third in vertical leap and Robinson was 12th. Lewan and Robinson was first and third and Matthews was 11th in broad jump. And Matthews and Lewan were second and fourth in the three cone drill. Of the three Lewan had the best rankings overall, holding the best 40 time, top 10 on the bench, third in vertical leap and first in the broad jump. NFL Network analyst Mike Mayock had a quick review of the first two days of workouts at the NFL Combine and outlined who he liked and who may have disappointed during the workouts by offensive linemen, tight ends, quarterbacks, running backs and wide receivers. One position group that Mayock thought had a tough time this weekend were the tight ends. Mayock admitted he didn’t see all the quarterbacks throw due to his broadcasting responsibilities, but did like a few of the signal callers he did observe. “I thought both (AJ) McCarron and (Blake) Bortles looked good. Now I didn’t see everybody, but I thought those two guys looked pretty good. I think (Virginia Tech’s) Logan Thomas will continue to act as a huge wild card. He’s got no footwork whatsoever, but he delivers the football beautifully. “As far as the running backs go (Jerick) McKinnon is a real big wild card too. He could play corner or safety too and he had a big day. I thought the (Bishop) Sankey kid caught the ball well, which I wanted to see him do.